BUZZ Gear has had the opportunity to create some exceptional Gear for some exceptional teams, many related to jiu jitsu, but not all. All of these designs started with a conversation about mood, interest, and inspiration, and followed by a sketch on a piece of paper. Our minimum order for a design is 20 shirts, with cost per shirt decreasing as quantity increases. References upon request. For price quotes please email buzzgearbjj@gmail.com. "Very talented people for Buzz Gear ...Excited to see what the future holds!" 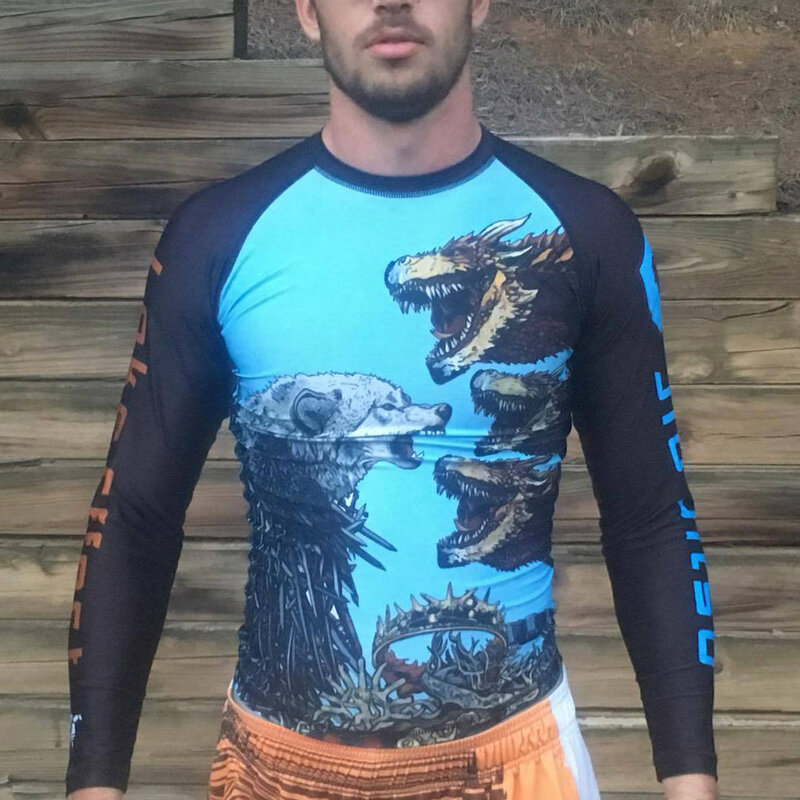 The Game of Thrones rashguard was a custom team order the BUZZ created for Lake Effect Martial Arts (LEMA), a Brazilian Jiu Jitsu school out of Buffalo, NY. Mike Katilus, owner of LEMA, approached us about his idea for a shirt, and together we worked on the theme of Fire vs Ice, based on George RR Martin's famous Game of Thrones series "A Song of Ice and Fire". After speaking with Mike about the look he was hoping for in his shirt, we knew we would need a little help. Enter Katie Allen, a Medical Illustrator with a deep understanding of collage composition. Together, a mini story was born, of the battle between Direwolves and Dragons over the Iron Throne and the many crown's of false kings. On the back we integrated something we had not seen yet in rashguard design, the backplate. We utilized this location for dynamic advertisement, as we noticed most gis would rise up on a jiujiteiro's back, revealing the bottom hem of the back of the rashguard. View this and the rest of the rashguard by clicking the button below! The Red Storm Football Undershirt was our first team design. Eric Bennett, Head Coach for Saranac Lake High School in Upstate New York, mentioned interest in an undershirt that did not follow the typical "Tornado" or "Storm-Cloud-Shooting-Lightning" trend that had been beaten to in previous SLHS sports gear. We read the famous sailor's phrase "Red sky at night, sailor's delight. Red sky at morning, sailor, take warning". Drawing inspiration from this phrase we wanted to make something that would appear normal but with a hidden reveal. "Buzz is amazing. I highly recommend them to anyone. They designed our jiu jitsu gis and rashguards so the whole team looks stylish while choking you out! " Our second gi design for Josh Ketry, owner of FFKC, was based on the intelligence of the jiujiteiro. Josh is fascinated by the patterns and science that nature provides, and how nothing is randomly placed. One pattern in particular drew Josh's eye, the Fibonacci Sequence or Golden Ratio, with ratios that approximate to Phi. We took the idea of the Golden Ratio spiral and ran with it, adding patches in spots that would make the gi as beautiful as possible, but also keep it IBJJF legal so that practitioners would be able to wear this gi at the highest levels! Josh Ketry, Owner of FFKC, had always told us that there are standards to judge a business by other than just profits and growth. To exemplify this, the Fight Family Kimono Company and BUZZ collaborated to create the Gis That Do Good line of Brazilian Jiu Jitsu Kimonos. 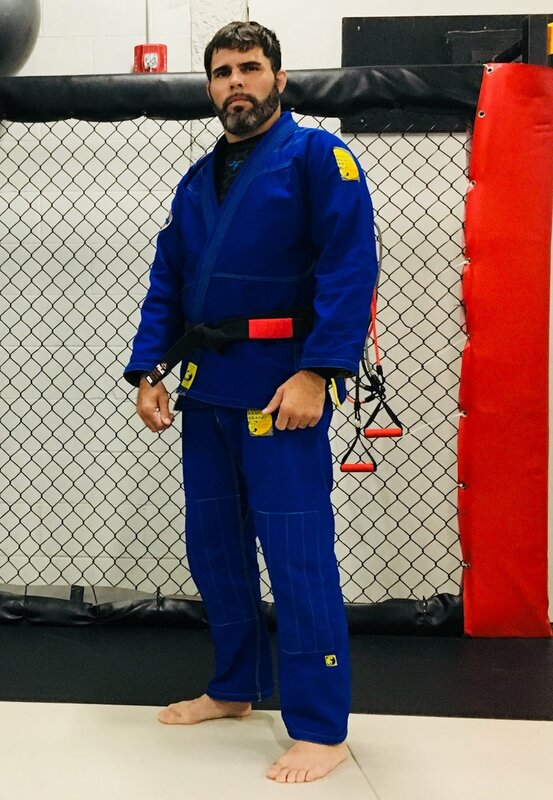 For every two gis that were sold, one gi would be donated to Specter Jiu Jitsu, a BJJ program for low income youths. This was incredibly valuable as BJJ is a program that has a high cost of entry (gis and membership fees), something that many kids that could benefit from this program would not be able to pay. By partnering with a not for profit BJJ program that offers free classes, the FFKC was able to pick up the other half of the bill and make the art of jiu jitsu available for all.